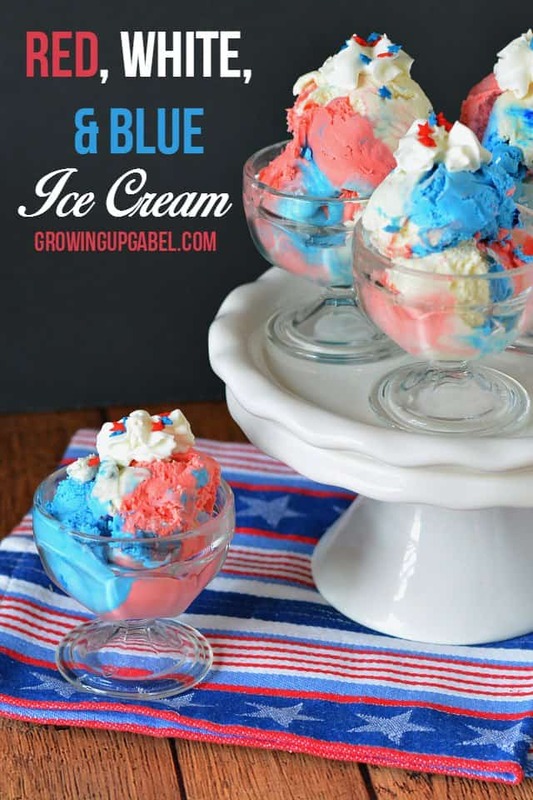 Make homemade ice cream recipe in red, white, and blue for a fun and festive 4th of July dessert! 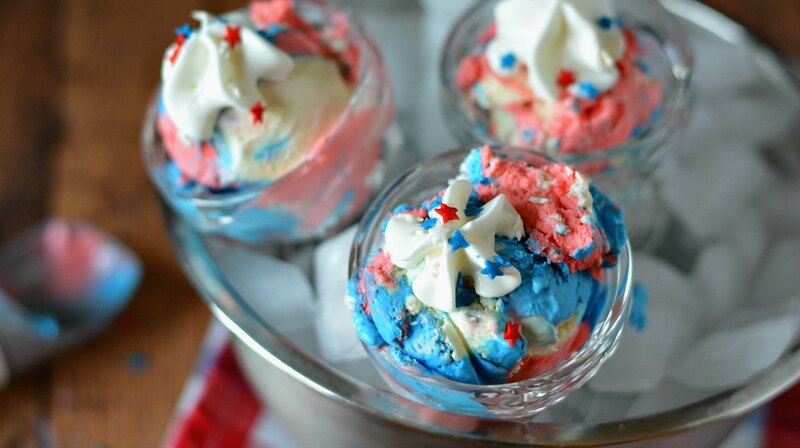 No ice cream maker is needed for this easy 3 ingredient no churn ice cream recipe. It is no secret that I love homemade ice cream. And ever since discovering a homemade ice cream recipe to make ice cream without an ice cream maker a few years ago, I just can't stop making it! Love peaches? Try homemade peach ice cream made with fresh peaches. 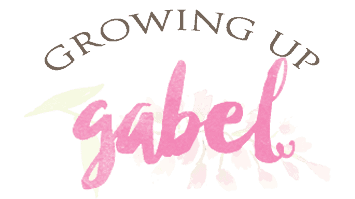 Want something new and fun? Honey Lavender Ice Cream recipe sounds weird but it's delicious! I've had fun messing around with the flavor of the ice cream, but I'd never messed around with the colors. 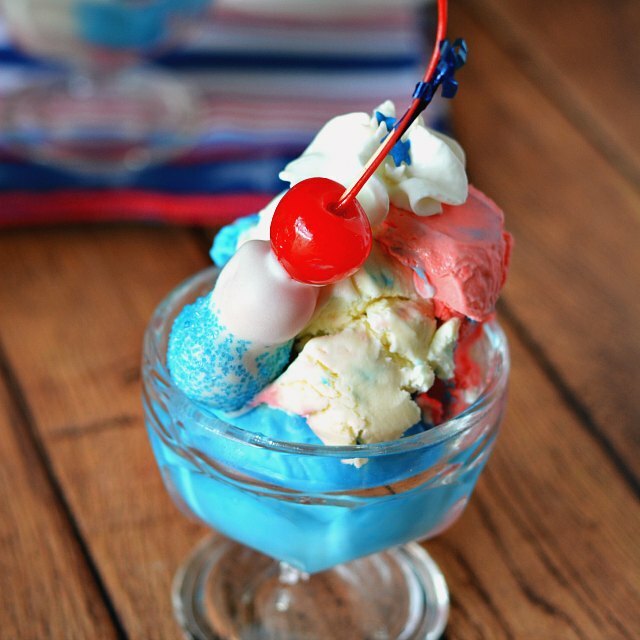 And since it's summer – I had to try red, white, and blue ice cream! This is super easy to make! And if you want to make different colors, have fun with it. Basically, make up a batch of homemade ice cream. 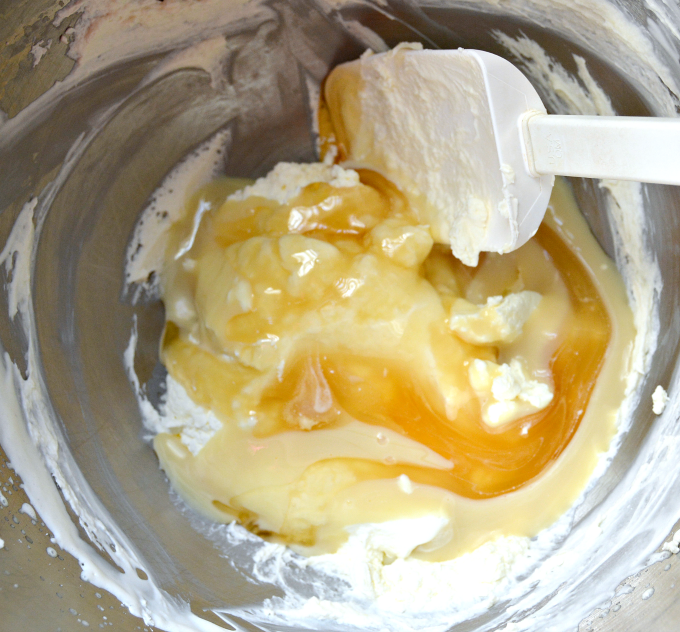 Whip the whipped cream and add in the sweetened condensed milk, and vanilla extract. To make the three colors, pour 1/3 of the ice cream in to one bowl and another 1/3 into a third bowl. Dye one bowl red and one bowl blue. I like to use a Tovolo ice cream tub to freeze the ice cream. That's the honey lavender ice cream in the Tovolo. But a wax paper lined bread loaf pan works, too. 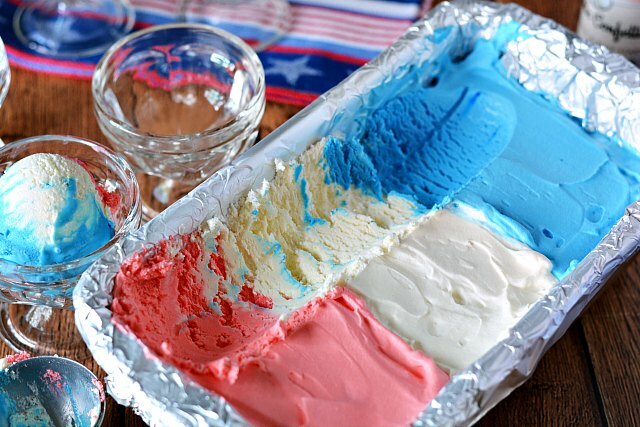 Pour each individual of color ice cream next to each other in the pan. You could probably swirl the colors, too, if you wanted to. Cover the container and freeze until the ice cream is solid. Scoop and serve! Top with whipped cream, sprinkles, and even some cherries. Make one batch (or two for more ice cream) of this homemade ice cream recipe. Before pouring the ice cream in to a container to freeze, divide the ice cream in to thirds. Dye one third of the ice cream red. Dye one third of the ice cream blue. Leave one third of the ice cream white. 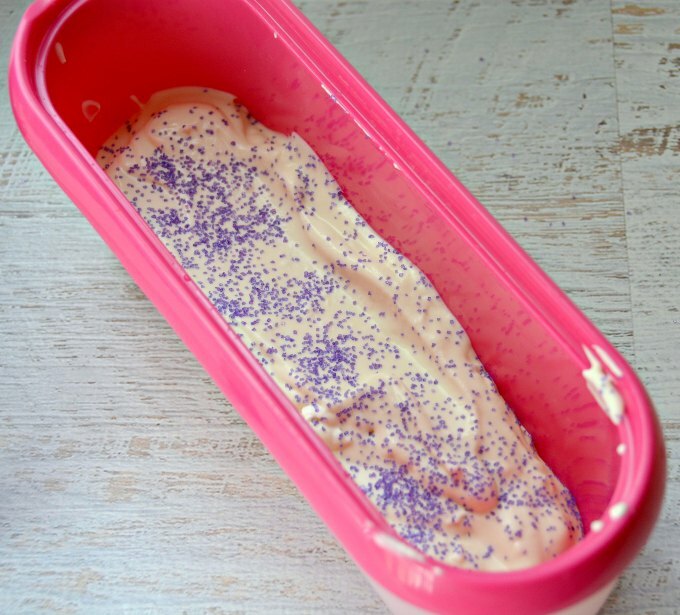 Pour the ice cream into a container to freeze. Pour each color next to each other. Or layer on top of each other. Cover and freeze until the ice cream is hard. We will love this delicious Ice Cream! Thanks so much for sharing with us at Full Plate Thursday. Have a great week and come back soon! We have company coming next week, I am going to make this! Thanks! Ready for the holiday! Thanks for sharing at the What’s for Dinner Party! Yum!! Thank you for sharing with us at #HomeMattersParty .We would love to have you again next week. Oh yum, Camille! So fun! 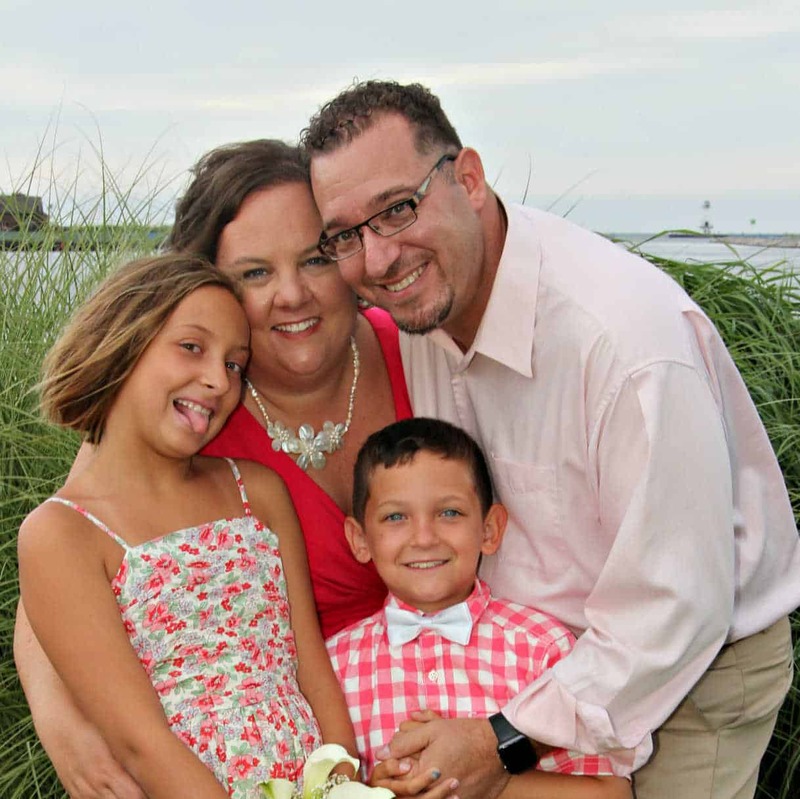 Thanks for linking up with us at Throwback Thursday! Have a great Memorial Day Weekend! Looks so yummy. Pinned & shared. Thanks for joining the Inspiration Spotlight party. Hope you have a great Memorial Day weekend!! Such a cute, fun idea! Very festive – and who wouldn’t love a bowl full of this? !